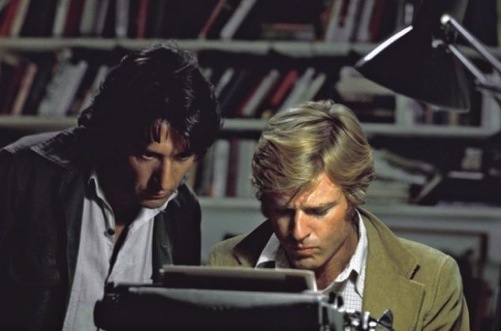 Dustin Hoffman, Robert Redford in 1976’s All the President’s Men. Pleasant surprise. It’s Robert Redford on the phone for a five-minute one-on-one interview that wasn’t supposed to be -- until the last minute. A half-hour conference call with “select reporters,” as an email invitation put it, was being set up for Thursday, April 11th in connection with Discovery Channel’s All the President’s Men Revisited. It’s a 90-minute documentary film premiering Sunday, April 21st at 7 p.m. (central). Your friendly content provider felt pretty good about being included in the mix, but didn’t really expect to get a question in. Realistically, unclebarky.com tends to be pretty low in the pecking order in these circumstances. They’re understandably going to take the bigger fish first. But shortly before start time, another email said the format had been changed. Redford’s representatives would be calling directly, and I’d get five minutes of my very own with him among the six reporters participating from far media entities such as The New York Daily News and The Huffington Post. “You get the ‘sound bite’ “ segment, Redford said affably as we went on the clock with his publicist keeping time. The Discovery film, for which Redford is narrator, interview subject and co-executive producer, looks back at the making of the 1976 film All the President’s Men while also gathering many of the surviving real-life principals for new interviews. Rachel Maddow and Jon Stewart, who respectively were one- and 11-years-old when President Richard Nixon resigned on Aug. 8, 1974, are also included in the parade of talking heads. It’s Stewart’s belief that a Hollywood studio wouldn’t have green-lighted All the President’s Men for the big screen without its over-riding cloak-and-dagger figure. Redford, who co-starred as Washington Post investigative reporter Bob Woodward, won’t go quite that far. Redford and co-star Dustin Hoffman reunite for the Discovery film, sitting in deck chairs after exchanging pleasantries. But very little of their conversation made the final cut amid all the other talking heads and archival footage. Redford seems a little vexed by this. Watergate dawned long before the blogosphere and its innumerable partisan attackers. Would Woodward and Bernstein have been cut off at the neck the way Dan Rather was in the immediate aftermath of his 60 Minutes II report on George W. Bush’s questionable Texas Air National Guard service? It’s also Redford’s belief that the “toxic” atmosphere in today’s Washington would have blocked the nationally televised Senate Watergate committee hearings that led to Nixon’s resignation. At least one of the former president’s men remains steadfastly loyal to his old boss. Ben Stein, who graduated with Bernstein in 1962 from Maryland’s Montgomery Blair High School, went on to write speeches for Nixon and also serve as one of his lawyers. Archival footage in the Discovery film shows him tearfully watching Nixon say goodbye to his staff. And Stein weeps anew in the new interview for All the President’s Men Revisited. But he’s not finished talking yet. Redford is scheduled to promote All The President’s Men Revisited on NBC’s Meet the Press this Sunday. And before that, there’s an invitation-only April 18th screening of the film at the Newseum in Washington, D.C., with Redford, Woodward and Bernstein participating in a follow-up Q&A.